Cover Wars: Pursuing Lord Pascal VS A Code of Love + Win Both Books! The winning cover for this Cover Wars event is Pursuing Lord Pascal by Anna Campbell! Cover wars begins again. It's Pursuing Lord Pascal by Anna Campbell VS A Code of Love by Jacki Delecki. 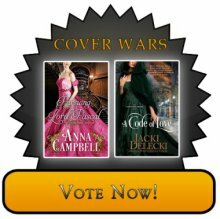 Vote for the cover you like the best! Cord's passionate attraction for the indomitable Henrietta hasn't diminished in his four years abroad, but neither has Henrietta's memory of his libertine past. As England's new Director of Intelligence, Cord faces more peril protecting the Harcourt family of brilliant code breakers than he did as an undercover spy in Napoleonic France. Henrietta's brother, on a clandestine assignment in Paris, has vanished. THE CODE BREAKER SERIES Men and women from the class of privilege and rank risk their lives to defend England against the treacherous designs of Napoleon. They confront disaster, scandal, and passion as they pursue their code of honor and love.